Paul VI’s Naomi Shorts (left), shown last season, led her team to victory on Saturday. Wykira Johnson Kelly surpassed 1,000 points for her career Saturday by scoiring 20 points as the Delsea girls' basketball team's comeback fell short against Haddonfield, 45-42. The Crusaders outscored the Bulldogs by 11 in the fourth quarter. Keegan Douglas delivered with 20 points for Haddonfield. Hannah McHugh shot 9 of 13 from the field for 17 points as Holy Cross edged Westampton Tech, 46-44. Sara Peretti and Jada Thompson scored 12 points apiece as Hammonton sneaked past Lower Cape May, 47-46. The Blue Devils held onto a 13-point halftime lead. Sierra Sanson scored a game-high 21 points as Shawnee upended Haddon Township, 57-46. Cameron Morgan had 18 points for the Renegades. Meghan Connelley led Audubon with seven points in a 32-27 win over Our Lady of Mercy. Jessie Klenk and Latanya Berry combined for 21 points in Sterling's 37-25 triumph over Highland. 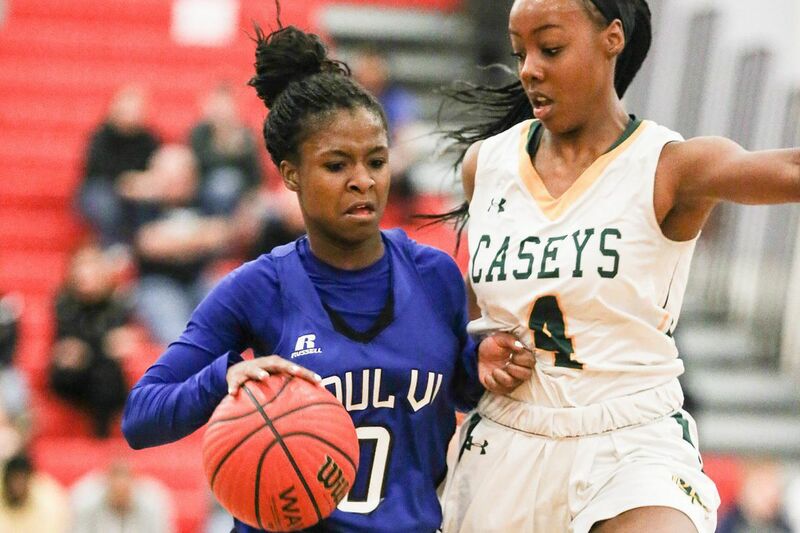 Naomi Shorts posted 18 points, seven assists, and five steals to lead Paul VI over Eastern, 67-52. Sekya Cambell added 14 points and seven rebounds for the Eagles. Brittany Garner led all scorers with 22 points as Winslow Township topped Lenape, 46-37. Jeff Undercuffler scored a game-high 23 points as Holy Cross outlasted Cedar Creek, 73-69, in double overtime. Kevin Wood and Zac Taylor each added 21 and 20 points, respectively, for the Lancers. Akhil Giri scored 20 points as Moorestown upended Notre Dame (N.J.), 80-73, in double overtime. Nick Cartwright-Atkins had 20 points for the Quakers. Cartier Bowman finished with a game-high 32 points in a losing effort. Karsten Johnson poured in 27 points as Northern Burlington defeated Westampton Tech, 73-71. Josh Jackson had 13 points for the victors. Stan Martin scored 27 points in a losing effort. Miles Thompson compiled 17 points and 17 rebounds to lead Camden over Washington Township, 56-39. Corey Greerscored a game-high 19 points for the Panthers. Nick Hazel scored 20 points to lift Florence over Burlington Township, 56-51. Jabril Enmond and Kahlil Lewis each had 10 points apiece for the Flashes. Tyshon Judge recorded 22 points in Paul VI's 75-67 triumph over Eastern. Hartnel Haye had 16 points for the Eagles. Carl Gibson and Sam Serata each scored 24 points as Cherry Hill East downed Woodrow Wilson, 88-65. Andrew Sims scored 17 points in Lenape's 49-41 victory overr Winslow Township. Matt Ingersoll had 12 points for the Indians. Nico Ferrari and Regan scored 18 points apiece as Gloucester Catholic defeated Gloucester, 52-40.